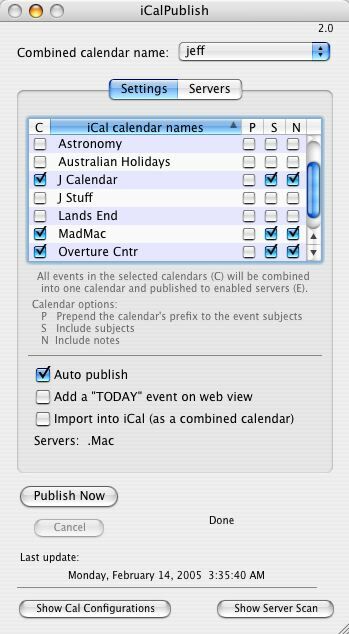 Combine multiple iCal calendars and publish them to your .Mac account or a WebDAV server. Check out the "downloads" section, below! Apple's iCal application allows you to publish your calendars so anybody can view them on the web. However, if you have multiple calendars (e.g., work, home, school), iCal 1 won't combine them so they all appear together on the same web page and iCal 2 won't allow you to combine individual calendars in more than one group. iCalPublish allows you to combine individual calendars and publish them as one calendar to your .Mac account or another WebDAV server for viewing on the web. iCalPublish is shareware. See below for registration instructions. ... iCalPublish ... [is] a useful, one-of-a-kind utility for those of us who have more than one iCal calendar and want to publish them together. And the included ReadMe file is clear and understandable, which can't be said for a lot of the software I review for Mac Gems. Use this version on 10.2. Does not support multiple calendars, multiple servers, or WebDAV (only .Mac). If the P S N T checkboxes settings don't stick after you quit and relaunch iCalPublish, update to version 2.5.2. Some uses have reported that suddenly all of the events on the web view appear to be time shifted to GMT or some other time zone. This effect, seen when using Apple's web server, is more likely to occur if you are syncing your calendars between multiple machines or a PDA (phone or Palm Pilot). Often, the trouble goes away by itself. If not, use iCal to export and then import your separate calendars. If that does not help, then look at the upper right corner of the web view. If, instead of the publication date, time, and time zone which is normally displayed there you see one of your individual calendar names, that calendar is likely causing the problem. Temporarily remove it from your list of combined calendars to verify this. Does not publish alarm (on Leopard only). Fixed issue where PSNT checkboxes settings would not stick. Updated to work better on Leopard. Universal binary and other speed improvements for handling calendarswith many events. Updated to work on Leopard. Added a checkbox to suppress ToDo items (useful for the icalx server). Locations, attendees, and URL fields are also suppressed if you are suppressing either subject or notes. Lowered the risk of an incorrect import to iCal (if the "Import into iCal" checkbox is on). iCalPublish will now delete and then create a calendar with the proper combined calendar name. You still need to acknowledge the dialog from iCal each time. Fixed a bug that caused one event from the first calendar (alphabetically) to be missing. Import into iCal - Combined calendars can be viewed in iCal without using a remote server. I'm no longer supporting iCalPublish because Apple has added features to iCal that solve some of the problems (e.g., groups), and there have been no paid registrations for a few years. You can still contact me with questions, but I won't be able to make changes. You can "self register" by turing on the checkbox in the app, There is no registration number, just an "I've paid" checkbox in the registration window. Use the "Register..." menu, click "Register" which will take you back here, then just return to iCalPublish and you'll see the checkbox. Don't feel quilty. Jeffrey Mattox: Email me, I love my Mac!